[This meditation originally posted at our church blog in preparation for the Lord’s Supper]. The Lord’s Table presumes that sinners will come and feast at a banqueting table of grace. There are none who approach the Table without sin, but neither are there any who rightly assess their sin. Therefore, we need to ask like David did: “Who can discern his errors?” And in turn, let God speak to us through his Word to find the answer. Assurance to approach the Lord’s Table as the Word of God calls to fresh faith in the gospel of Jesus Christ. David’s question in Psalm 19 is an honest acknowledgement we who need to examine ourselves are bereft of the tools do it. Fortunately, God has spoken light into our darkness. In the rest of the psalm, we find God speaking in his world (vv. 1–6) and his Word (vv. 7–11). While God’s inaudible voice can be heard through the creation we see, it is the Law of God—the Torah—which is designed to expose our wretchedness and lead us to our Redeemer (v. 14). At the heart of Psalm 19, we find 6 lines praising God’s variegated word (vv. 7–9). By taking the reverse of God’s perfections, we can ask a handful of questions that help us prepare for communion. (I include a handful of other verses that amplify the truth of each verse). 7a: What idols are stealing my joy? What part of creation (i.e., a person, a thing, a hobby, etc.) do I need to release or revalue? 7b: What patterns of foolishness do I continue to pursue? 8a: What joylessness do I need to confess? 8b: What darkness do I need to evade? What truth am I choosing to suppress? 9a: What spiritual discipline have I neglected? What distraction has prevented me from personal devotion to the Lord? 9b: What command am I willfully ignoring or breaking? What sin do I need to relinquish? Ask the Spirit to use these questions to search your heart (Psalm 139:23–24). Trust him, that he will bring to mind those attitudes and actions you need to confess. This is what Jesus said the Spirit would do (John 16:8). It is not incumbent on us to reveal sin (see Philippians 3:15), but to repent of it when it is revealed. At the same time, let this light drive you to a renewed sense of awe at God’s mercy. It is through the repeated process of conviction and cleansing that God’s sanctifies us. And even more, as Psalm 19 says, God’s Word revives, makes wise, gladdens, enlightens, strengthens, and straightens (justifies) those who are weary, foolish, joyless, blind, deceived, and sinful. In other words, the purpose of examination is never, NEVER condemnation, but cleansing that brings us closer to God—the source of our greatest joy (Psalm 16:11). For this reason, the call to examine ourselves should not be perceived as a religious drudgery—something like having a monthly root canal. Just the reverse. Paul’s invitation to examine ourselves moves us past the uncertainty which plagues us—“who can discern his errors?”—to the steadfast assurance that God loves us and sent Jesus to bring us into his family. Christ died to assure our hearts of God’s love. But that assurance comes by confronting sin, not covering it over. We take the Lord’s Supper to remember Christ’s atoning death, which necessitates a sober reflection upon our sin. 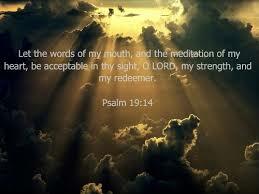 Wonderfully, we don’t have to wonder if our words are made acceptable before God. If we examine ourselves with the Word and confess sin as the Spirit convicts, we can rest in this promise: “He is faithful and just to forgive our sin and cleanse us of all unrighteousness” (1 John 1:9). As we approach the Lord’s Table this Sunday, take time to read Psalm 19 and the questions listed above. Use them as a means of examining your heart, confessing your sin, thanking God for the forgiveness that comes through Christ, and preparing to partake of the bread and cup.